Can't afford to sit around a-wishin'…" – which some folks sang as "Can't afford to be a politician." Indeed. Sen. Obama's remarks about poor dumb, bitter rural losers "clinging to" guns and God certainly testify to the instinctive snobbery of a big segment of the political class. But we shouldn't let it go by merely deploring coastal condescension toward the knuckledraggers. No, what Michelle Malkin calls Crackerquiddick (quite rightly – it's more than just another dreary "-gate") is not just snobbish nor even merely wrongheaded. It's an attack on two of the critical advantages the United States holds over most of the rest of the Western world. In the other G7 developed nations, nobody clings to God 'n' guns. The guns got taken away, and the Europeans gave up on churchgoing once they embraced Big Government as the new religion. Europeans did "vote for their own best interests" – i.e., cradle-to-grave welfare, 35-hour workweeks, six weeks of paid vacation, etc. – and as a result they now face a perfect storm of unsustainable entitlements, economic stagnation and declining human capital that's left them so demographically beholden to unassimilable levels of immigration that they're being remorselessly Islamized with every passing day. We should thank God (forgive the expression) that America's loser gun nuts don't share the same sophisticated rational calculation of "their best interests" as do Thomas Frank, Obama, too many Democrats and the European political establishment. THE NORTH DAKOTA FIELDS HAVE JUST BEEN ASSESSED TO CONTAIN OVER 400 BILLION BARRELS OF OIL. THAT'S ENOUGH OIL FOR OVER 1000 YEARS. WE COULD STOP IMPORTING OIL TOMORROW FROM THE MIDDLE EAST. EXCEPT ONE LITTLE PROBLEM, THE ENVIRONMENTALISTS AND THE CONGRESS WON'T LET US DRILL OUR OWN OIL. INSTEAD THEY WOULD RATHER US BURN OUR FOOD SUPPLIES AND SEND OUR MONEY TO PEOPLE WHO WANT TO KILL US. SO BESIDES PAYING FOR THE EXPLOSIVES IN THE SUICIDE BELT THAT JUST KILLED A SCHOOL BUS OF CHILDREN IN ISRAEL, THE FOLLOWING IS WHAT OUR OIL DOLLARS ARE PAYING FOR IN SAUDI ARABIA INSTEAD OF THE USA. The Palm Islands in Dubai . New Dutch dredging technology was used to create these massive man made islands. The Burj al-Arab hotel in Dubai . The worlds tallest hotel. Entirely built in Germany and then assembled in Dubai , it is scheduled to be completed by 2009 after many delays. At an estimated height of over 800 meters, it will easily be world's tallest building when finished. It will be almost 40 percent taller than the current tallest building, the Yaipei 101. Dubailand. Currently, the largest amusement park collection in the world is Walt Disney World Resort in Orlando , which is also the largest single-site employer in the United states with 58,000 employees. The Dubai Marina is an entirely man made development that will contain over 200 highrise buildings when finished. It will be home to some of the tallest residential structures in the world. Some of the tallest buildings in the world, such as Ocean Heights and The Princess Tower , which will be the largest residential building in the world at over a 100 stories, will line the Dubai Marina . The UAE Spaceport would be the first spaceport in the world if construction ever gets under way. And ... The Dubai Metro system, once completed, will become the largest fully automated rail system in the world. The Dubai World Central International Airport will become the largest airport in size when it is completed. It will also eventually become the busiest airport in the world, based on passenger volume. There are more construction workers in Dubai than there are actual citizens. Recently, I wrote about Tarek ibn Ziyad Academy (TIZA), a K-8 charter school in Inver Grove Heights. Charter schools are public schools and by law must not endorse or promote religion. TIZA has many characteristics that suggest a religious school. It shares the headquarters building of the Muslim American Society of Minnesota, whose mission is "establishing Islam in Minnesota." The building also houses a mosque. TIZA's executive director, Asad Zaman, is a Muslim imam, or religious leader, and its sponsor is an organization called Islamic Relief. Students pray daily, the cafeteria serves halal food - permissible under Islamic law -- and "Islamic Studies" is offered at the end of the school day. Zaman maintains that TIZA is not a religious school. He declined, however, to allow me to visit the school to see for myself, "due to the hectic schedule for statewide testing." But after I e-mailed him that the Minnesota Department of Education had told me that testing would not begin for several weeks, Zaman did not respond -- even to urgent calls and e-mails seeking comment before my first column on TIZA. Now, however, an eyewitness has stepped forward. Amanda Getz of Bloomington is a substitute teacher. She worked as a substitute in two fifth-grade classrooms at TIZA on Friday, March 14. Her experience suggests that school-sponsored religious activity plays an integral role at TIZA. Before the assembly, she says she was told, her duties would include taking her fifth-grade students to the bathroom, four at a time, to perform "their ritual washing." "The prayer I saw was not voluntary," Getz said. "The kids were corralled by adults and required to go to the assembly where prayer occurred." Islamic Studies was also incorporated into the school day. "When I arrived, I was told 'after school we have Islamic Studies,' and I might have to stay for hall duty," Getz said. "The teachers had written assignments on the blackboard for classes like math and social studies. Islamic Studies was the last one -- the board said the kids were studying the Qu'ran. The students were told to copy it into their planner, along with everything else. That gave me the impression that Islamic Studies was a subject like any other." After school, Getz's fifth-graders stayed in their classroom and the man in white who had led prayer in the gym came in to teach Islamic Studies. TIZA has in effect extended the school day -- buses leave only after Islamic Studies is over. Getz did not see evidence of other extra-curricular activity, except for a group of small children playing outside. Significantly, 77 percent of TIZA parents say that their "main reason for choosing TIZA ... was because of after-school programs conducted by various non-profit organizations at the end of the school period in the school building," according to a TIZA report. TIZA may be the only school in Minnesota with this distinction. Why does the Minnesota Department of Education allow this sort of religious activity at a public school? According to Zaman, the department inspects TIZA regularly -- and has done so "numerous times" -- to ensure that it is not a religious school. But the department's records document only three site visits to TIZA in five years -- two in 2003-04 and one in 2007, according to Assistant Commissioner Morgan Brown. None of the visits focused specifically on religious practices. Zaman agreed to respond by e-mail to concerns raised about the school's practices. Student "prayer is not mandated by TIZA," he wrote, and so is legal. On Friday afternoons, "students are released ... to either join a parent-led service or for study hall." Islamic Studies is provided by the Muslim American Society of Minnesota, and other "nonsectarian" after-school options are available, he added. Yet prayer at TIZA does not appear to be spontaneously initiated by students, but rather scheduled, organized and promoted by school authorities. Until recently, TIZA's website included a request for volunteers to help with "Friday prayers." In an e-mail, Zaman explained this as an attempt to ensure that "no TIZA staff members were involved in organizing the Friday prayers." But an end run of this kind cannot remove the fact of school sponsorship of prayer services, which take place in the school building during school hours. Zaman does not deny that "some" Muslim teachers "probably" attend. According to federal guidelines on prayer in schools, teachers at a public school cannot participate in prayer with students. In addition, schools cannot favor one religion by offering services for only its adherents, or promote after-school religious instruction for only one group. The ACLU of Minnesota has launched an investigation of TIZA, and the Minnesota Department of Education has also begun a review. TIZA's operation as a public, taxpayer-funded school is troubling on several fronts. TIZA is skirting the law by operating what is essentially an Islamic school at taxpayer expense. The Department of Education has failed to provide the oversight necessary to catch these illegalities, and appears to lack the tools to do so. In addition, there's a double standard at work here -- if TIZA were a Christian school, it would likely be gone in a heartbeat. TIZA is now being held up as a national model for a new kind of charter school. If it passes legal muster, Minnesota taxpayers may soon find themselves footing the bill for a separate system of education for Muslims. On Sunday, CIA director Michael Hayden warned on "Meet the Press" that a reconstituting al Qaeda was preparing operatives in Afghanistan who would draw no attention while passing through U.S. airport checkpoints. That bureaucratic mediocrity has already exacted a high price. A major installment came due when the CIA and FBI missed the Sept. 11 plot. A second came a year later with the CIA's "slam-dunk" assessment that Saddam Hussein was acquiring weapons of mass destruction. In 2004, Congress radically reshuffled U.S. intelligence, creating a new intelligence "czar" -- the Director of National Intelligence (DNI) -- whose office, the ODNI, would assume many of the coordinating functions that had formerly been in the hands of the CIA. The most significant of these is the National Intelligence Estimate (NIE) of last November, which stated flatly in the first sentence of its declassified summary that Iran had halted its nuclear-weapons program. This was deeply misleading. As the NIE summary acknowledged only in a footnote, the most important element of that program -- uranium enrichment -- was proceeding at full tilt. In February, Mike McConnell, the current DNI, disavowed the document, acknowledging that it should have been handled differently. But by that time the damage to America's Iran policy -- and to the ODNI's own credibility -- had already been done. How exactly did the misleading NIE come to be drafted? The answer is not fully known. But a fascinating glimpse of troubles in the ODNI and the broader intelligence community comes from Nancy Bernkopf Tucker, until last summer an ODNI assistant deputy director. Ms. Tucker used her position, as she writes in the latest Washington Quarterly, to "galvanize change" among intelligence analysts. Under her tutelage, they would henceforth be required to "properly source evidence, avoid politicization, acknowledge uncertainty and assumptions, use alternative analysis, explain consistency or deviation, and strive for accuracy." It speaks volumes that Ms. Tucker hails the imposition of such basic requirements as if it were a revolution. But even putting elementary standards in place has not prevented other forms of trouble from multiplying all around. A striking 55% of all intelligence community analysts were hired after Sept. 11, 2001. Whatever the cost in lack of experience, the creation of a youthful and highly responsive workforce, motivated by a desire to get into the fight against America's enemies, has to be counted as all for the good. But what has happened to these young men and women once inside? According to Ms. Tucker, "they have been quickly indoctrinated into the conservative mind-sets that exist across the intelligence community." In other words, don't stick your head out, don't take risks. The ranking official in charge of analysis at the ODNI is Thomas Fingar, a principal drafter of the misleading Iran NIE and a former State Department official with a long record of undercutting the policies of the Bush White House. It is not an accident that back in September, shortly before the NIE was issued, Mr. Fingar selected as his deputy for "analytic integrity" Richard Immerman, a professor from Temple University who had taken part in "teach-ins" against the war in Iraq, and who had accused the Bush administration of gross malfeasance in the run-up to the invasion. The "Bushites," Mr. Immerman wrote of the White House in an essay published in January, made "every effort to 'cook the books,' they 'hyped' the need to go to war, and they lied too often to count." In addition to being in charge of maintaining analytic standards, Mr. Immerman also occupies the position of "ombudsman" within the ODNI. In other words, the very official responsible for investigating allegations of partisanship in the production of intelligence is himself a declared partisan in the intelligence wars. No wonder analysts are keeping their heads close to their desks. What is Mr. McConnell doing about this mess? His attention appears to be focused elsewhere. Late last year, under his guidance the ODNI unfolded a 500-day master plan to set things right. Along with a good number of unexceptionable steps, its number one "core initiative" is to "treat diversity as a strategic mission imperative" -- in other words, as the document explains, "We need to have an IC workforce that looks like America." Toward that end, the plan calls for the design of "mechanisms to hold IC leaders accountable for excellence in EEO [Equal Employment Opportunity] and diversity management." Should U.S. intelligence have a workforce that "looks like America," or would we be better off with one that looked like those of our adversaries whom we have been unable to understand, let alone to penetrate? That question is one of many that go unanswered in the 500-day plan, which focuses almost entirely on tertiary internal matters rather than on accomplishing the two most critical missions facing U.S. intelligence -- stopping terrorism and nuclear proliferation. IN THE NAME OF ISLAM.. 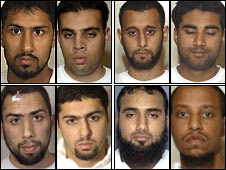 I see that eight men planned to detonate bombs aboard flights from London across the Atlantic to create deaths on an almost unprecedented scale, a court has heard. Homemade devices were to be smuggled on to passenger aircraft and detonated mid-flight, Woolwich Crown Court heard. Prosecutor Peter Wright QC said the men planned to inflict heavy casualties, "all in the name of Islam".